Two gallery visitors who were particularly charmed by the sculpture kept it in mind as they built their new home. Nearing the end of construction, they got in touch with Frank and asked him to create a similar piece for their front entryway. Just like the two pillars of the sculpture, Frank says the commission was all about maintaining a carefully balanced dynamic. First, Frank marked up an image of the original sculpture (left). ‘Complement’ was larger than his clients wanted, so he adjusted the scale and used the new measurements to resize some cardboard cutouts from the original project (center). The new, smaller cardboard pieces came together to create a full-scale model of the new piece (right). Next, Frank manipulated images of the cardboard model in Photoshop to show the flow of the fountain. The blue line you see on the edited photograph is where the water will fall on one side. The white piece of cardboard under the sculpture represents its base, which presented a unique problem. After tweaking the cardboard model, Frank took it apart and traced the pieces on stainless steel (left). He used tack welding to create a rough version of the piece (center and right). Tack welds allowed Frank to alter the form based on his client’s feedback. It took about a week to create the shiny sculpture you see on the left. The two red arrows mark openings for the water. Next Frank worked on the base of the sculpture, installing a pump and carefully feeding the electrical cord through a riser tube that holds it above the water (center and right). Frank cut mesh and steel plates to cover the base and prevent splashing. The slots you see around the sides of the sculpture are one of Frank’s latest innovations. Careful tests of the water flow followed. Frank got the final approval from the client and shipped it. 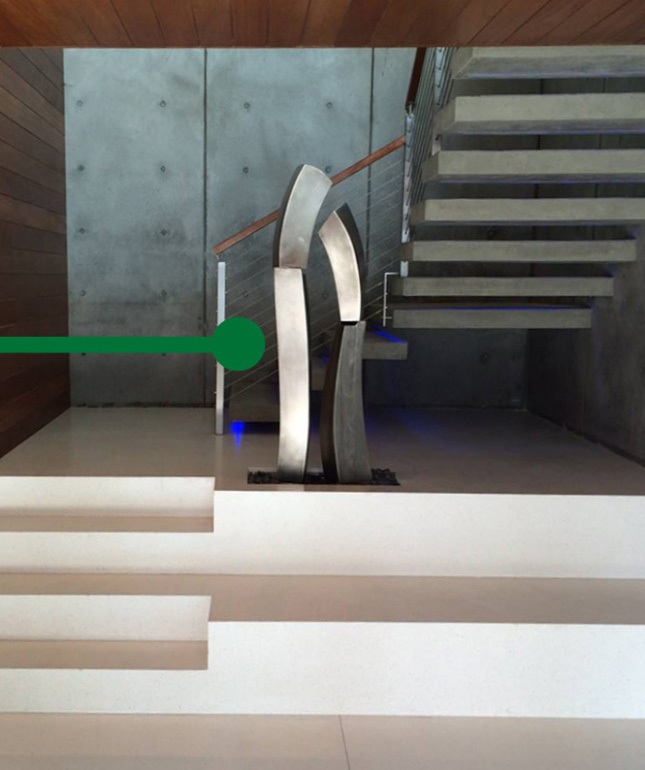 Frank’s clients sent back images of the piece in its new home, and the sculptor couldn’t be happier. See more of Frank Morbillo’s artwork on the Matthews Gallery website, and connect with us on Twitter, Facebook and Instagram for daily gallery news.